Excessor is a Lightroom plugin that allows you to apply a preset folder on a single image, generating ridiculous amount of virtual copies with applied presets. You can then further edit the virtual copies as you wish. Above you can see an example of single image and its 7 virtual copies, which are generated from a single preset folder (Lightroom 4’s B&W Presets) with a click of a button. After installation, the plugin can be opened from File -> Plug-in Extras -> Excessor. But first, you should select the image or multiple images from which you want to create new copies. After starting the plugin, simply select preset folder where to create developed virtual copies from. Optionally, you can also set virtual copy name to preset name or preset UUID. Clicking OK will start creating virtual copies. Now, click OK and you will see that Lightroom starts to render new preview thumbnails for your newly created virtual copies. Wow, I was thinking about coding something like this! Just as I was about to give up, because I read that the SDK doesn’t support creating Virtual Copies, I stumbled across your plugin. I understand you are faking out the system with keyboard stuffing, but this is exactly what I wanted to do. Initial testing did not work, but I just tried it again as I wrote this comment, and it seems to work now. Will definitely have to test further. What an awesome plugin, it is flawless and efficient. I used to do this by hand and it took forever. I wish I had learned about you years ago. I haven’t tried the others yet but won’t hesitate to support if I find them useful. Thanks. Can I request a new feature/plugin? Excessor creates a new virtual copy for each preset, would be nice to be able to create a new virtual copy for each Snapshot. In Develop mode, I like to go CMD + N regularly to save different versions of an image. It’s faster than making virtual copies, but the downside is that I can’t compare them side-by-side. Thanks. Unfortunately, it is not possible because Lightroom has no API for accessing snapshots. Plugins can create them, but not apply them. oh, too bad. Thanks for the reply. SnapToCopy supports conversion of snapshots to virtual copies for comparison viewing. Had Excessor running on my ‘old’ PC but cant seem to get it running on my new (64 bit) PC. Get error message regarding not finding VBscript. Also, I thought I had previously donated, but simply can not remember! Excessor should work fine on both 32 and 64 bit Windows versions (I just verified it on my new Windows 8 Pro 64 bit install). However, since there is no official support for creating virtual copies in Lightroom API, it uses VBScript to send events to Lightroom. It sounds like your VBScript installation is corrupted, probably by some installation script that did not use proper UAC elevation. Fixing it is a bit complicated, you need to see if VBScript is registered under current user (it shouldn’t be) and then re-register it using administrator access. There are instructions at http://www.jakeludington.com/windows_7/20091115_error_2738_could_not_access_vbscript_run_time_for_custom_action.html but be aware that this requires some advanced Windows hacker skills. If you have donated, you should have the transaction ID in your Paypal history. Paypal uses different IDs for seller and buyer, so I don’t have your ID, the activation process verifies it from the Paypal server. Although I had tried what you said, and verified I was in 64-bit CMD etc, I repeated the ‘reset’. I still get the ‘Can’t find script engine “VBScript” for script…’ error. This is a mystery to me. Do you have any other pointers to resolve this? For example what registry settings should I be looking for? Exactly the plugin I searched for! But I have a little improvement request, which meets our requirements perfectly: A random generator! We need a plugin like Excessor, but just use a defined number of presets; let´s say two out of ten – chosen by accident. Could this be possible? We need such a plugin urgently – donations follows the solution! THANKS & Greetings from Austria! Ahem, I have actually written such plugin, I just never took the extra effort of releasing it! 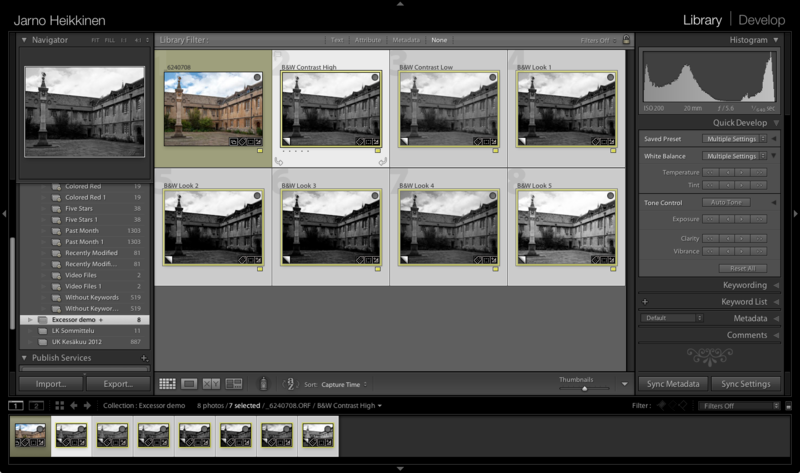 It works by selecting a set of photos, a preset folder and it applies random preset from the given folder. Hi. What is the maximum number of presets that can be applied? It is not limited by the plugin, I’ve tested it with 1500 presets. I haven’t used the virtual copies yet. So, it is possible to edit and export them after that? Seems like a cool plugin. Hm tried plugin. it creates virtual copies but no preset is applied. tried both my personal created ones, third party’s and native LR. I tried emailing you, but the address you gave bounced. I’ve never heard about this happening before. If you look at the virtual copy in Develop module, do you see entries in the History panel? Lightroom doesn’t update the thumbnails in Library view until the plugin dialog is dismissed, but the thumbnails should update shortly after OK is clicked. Do you have any other plugins running that might interfere? Great work you’ve done here ! May I suggest a new feature : is it possible to apply just one preset and not an entire folder of presets ? It would be very handy to just turn black and white, or what ever preset, for a bunch of photos and not to use all of the presets that you know won’t fit right anyway. I’m not sure if I understand correctly, but you want to apply one preset to multiple photos? Lightroom already does that, no need for external plugin. First select the photos, the use either the Quick Develop panel to apply the preset, or go to Develop module, make sure Sync button on the right panel is set to Auto Sync and apply the preset.